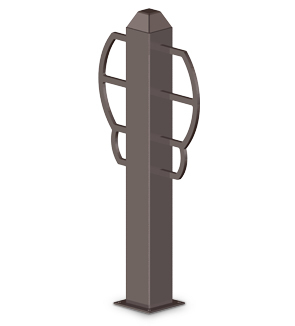 The Windsor Series Bollard Bike Rack is perfect for commercial or residential use to encourage your customers or employees to bike to your business. The curves and angles have a charming style that will enhance any outdoor setting. Solid steel construction will provide many years of service. Continuous weld seams penetrate the metal and ensure a weld that is virtually inseparable and rust deterrent. Heavy-duty 4" x 4" square post serves as a security and/or traffic barrier to help protect pedestrian walkways. Protected with 7-15 mils of polyurethane powder-coating in your choice of colors shown below. Pre-drilled holes to mount to a flat surface such as concrete. Matching bike rack, trash receptacle, and picnic table available.